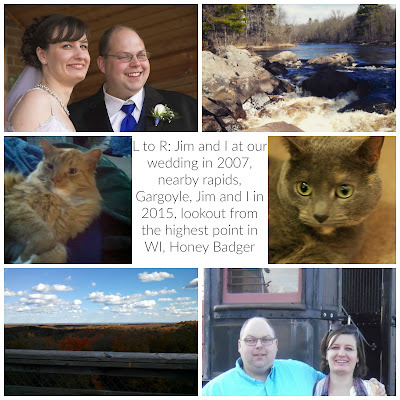 Living in northwest Wisconsin means you spend a lot of time outside. We don't have many big cities nearby, but we have plenty of woods, water, and nature to enjoy. Two weekends ago, I went geocaching with some girl friends and we had way more fun than any of expected. 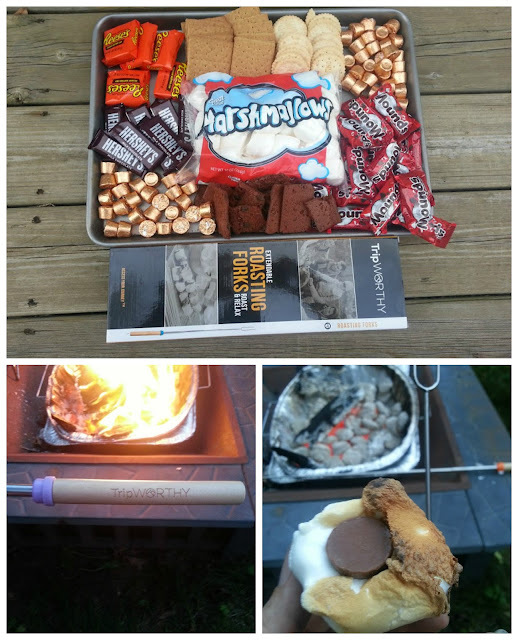 This week we got together for a campfire and to try out some new marshmallow roasting sticks. Since we got together after work, I wanted to make something quick and tasty for supper. 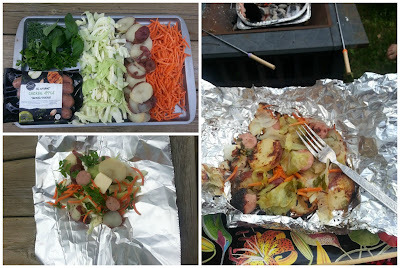 So, we roasted some veggies in the coals. I had gotten everything cut up in the morning, so when my friends arrived, I was able to just lay everything out on a tray and let people assemble their packets. I used precooked sausages, but you can use hamburger or hotdogs or whatever you like. I also precooked my potatoes because I wanted to be sure they would be done in time. I also used julienne carrots, shredded cabbage, onions, parsley, basil, and chives. But, you could add mushrooms, cauliflower and whatever other veggies you desire. You simple pile your selection on to a sheet of aluminum foil, add a little butter, salt, pepper, whatever you like. Then tightly wrap it up and bury it in your campfire. We only roasted ours for about fifteen minutes and as you can see, it was cooked through. Size of packets and fire temp will definitely affect your cooking time, you also need to be sure your meat is cooked if you use something like raw hamburger. There's something about cooking your food over a fire that makes it extra tasty! I'm hoping to get a couple more campfires in before the snow falls. For dessert, smores, of course! But, I wanted to fancy it up a little, so I decided to go beyond just Hershey bars and grams. I also had mini Mounds bars, Rolos, Reese's Peanut Butter Cups, Brownie Brittle and gluten free crackers. It was fun trying different combinations and I ate way too many marshmallows. Tripworthy sent me a box of their roasting sticks to try. They're telescoping, so they fold up small and have a handy little carrying case. My first impression was that they didn't feel super sturdy, but I was wrong, they held up great to a night of roasting and the handles are nice and smooth. While you can buy stronger sticks, they don't fold up and these worked perfectly. If you do a lot of camping away from home, these are worth a look due to their travel friendliness. So, what's your favorite thing to roast over your campfire? Let me know in the comments below. I received these roasting sticks from Tripworthy in exchange for an honest review. All opinions are my own.